Northeast Pennsylvania and the Binghamton, NY areas. 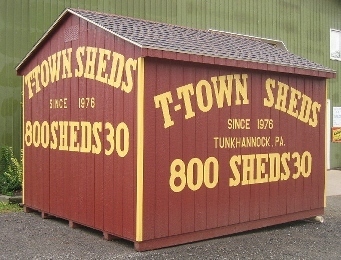 of our original sheds from 1976 are still in use today. Your site must be prepared and level and accessible to our truck and trailer. If you are unsure of your site we will make arrangements for a site visit. For further information, please contact us by phone. We take pride in the quality and workmanship of our products. Other hours can be arranged by appointment.